Last week, new online Scripture Mastery games were announced by the Church. I was involved in this project, and so I’d like to take a minute to tell you about the new features of these wonderful online activities. New Scripture Verses. The new activities contain the new scripture mastery verses. About 30% of the verses have been changed from what they used to be over the past several years. The new verses reflect prophetic direction regarding what the brethren feel are scriptures that teach the doctrines and principles that youth today need most to understand and apply in their lives. Tracking Progress. The new activities have each user log in with their LDS Account, and then progress through the activities is tracked. Each activity has an easy, medium, hard, and mastery level of difficulty. Users can work their way through the activities and slowly increase their level of difficulty and have their progressed tracked. When they leave the activities, they can come back another time and pick up where they left off. And they will know when they have mastered the learning activities. Languages. These new activities are available in ten languages: English, Spanish, Portuguese, French, Italian, German, Russian, Korean, Chinese, and Japanese. Making activities that worked in ten languages was not an easy challenge. For example, the much loved game with hints of the first letter of each word would not work in far eastern languages. We had to develop games that worked in both roman languages and those with more complex characters. Purposes of Scripture Mastery. Perhaps most importantly, these new activities focus on the four purposes of Scripture Mastery. The new Scripture Mastery activities website has three activities, one for Locate, Apply, and Memorize. A fourth activity for Understand is scheduled to come out next year. These activities will help youth not only memorize the scripture verses, but help them locate the scripture references, understand the doctrines and context of the scriptures, and apply the scriptures to their daily lives. There are many more benefits of the new online Scripture Mastery games, but I can’t mention them all here. Go play them, though, and you will see for yourself. Enjoy! Summary: Based on the authority bestowed by God and historical precedence, the senior apostle becomes the next prophet and president of the LDS Church when the current prophet dies. If the President of the LDS Church were to die, how is the next prophet chosen? This is an important doctrinal question and one that many missionaries will likely face in the course of their daily missionary work. Let’s discuss it. 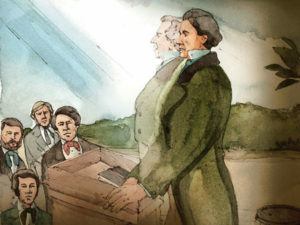 The first time the Church of Jesus Christ of Latter-day Saints had to face the issue of succession in the presidency was at the martyrdom of the prophet Joseph Smith. Joseph was the founder and president of the Church from its formation (see the revelation from the Lord in D&C section 20). After the death of the Prophet Joseph Smith, there was some confusion as to who should lead the Church. Sidney Rigdon, who had been a member of the First Presidency with Joseph Smith, was among those who claimed to be the next leader of the Church. Parley P. Pratt, an original member of the Quorum of the 12 Apostles, spoke of this time in his autobiography. “It was the first sound of his voice [Brigham’s] which the people had heard since he had gone east on his mission, and the effect upon them was most wonderful. Who that was present on that occasion can ever forget the impression it made upon them! If Joseph had risen from the dead and again spoken in their hearing, the effect could not have been more startling than it was to many present at that meeting. It was the voice of Joseph himself; and not only was it the voice of Joseph which was heard; but it seemed in the eyes of the people as though it was the very person of Joseph which stood before them. A more wonderful and miraculous event than was wrought that day in the presence of that congregation we never heard of. The Lord gave His people a testimony that left no room for doubt as to who was the man He had chosen to lead them. They both saw and heard with their natural eyes and ears, and then the words which were uttered came, accompanied by the convincing power of God, to their hearts, and they were filled with the Spirit and with great joy. There had been gloom, and, in some hearts probably, doubt and uncertainty; but now it was plain to all that here was the man upon whom the Lord had bestowed the necessary authority to act in their midst in Joseph’s stead” (“Joseph Smith, the Prophet,” Juvenile Instructor, Oct. 29, 1870, 174–75). In another revelation, the Lord affirmed that the Quorum of the Twelve Apostles holds the priesthood keys, the same as the Savior’s apostles of old, to direct the Church: “And also with Peter, and James, and John, whom I have sent unto you, by whom I have ordained you and confirmed you to be apostles, and especial witnesses of my name, and bear the keys of your ministry and of the same things which I revealed unto them; Unto whom I have committed the keys of my kingdom, and a dispensation of the gospel for the last times; and for the fulness of times, in the which I will gather together in one all things, both which are in heaven, and which are on earth” (D&C 27: 12-13). Brigham Young, as president of the Quorum of the Twelve Apostles, began leading the Church from the time of the martyrdom of Joseph Smith. In time, the First Presidency was reorganized under that authority, and new apostles were called to fill the vacancies in the Quorum of the 12. And so it is today, if the prophet dies, the First Presidency is dissolved. Presiding authority to lead the Church remains with the Quorum of the 12 and the senior apostle becomes the new Church President. 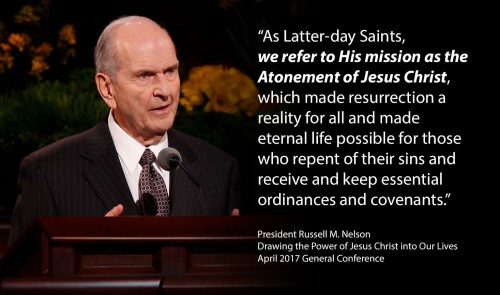 The First Presidency is automatically dissolved. The two counselors in the First Presidency revert to their places of seniority in the Quorum of the Twelve Apostles. Seniority is determined by the date on which a person was ordained to the Twelve, not by age. 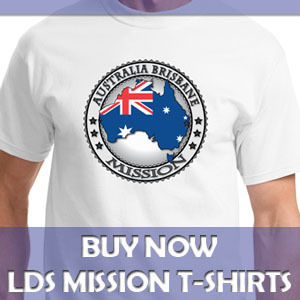 The Quorum of the Twelve Apostles, … headed by the senior apostle, assumes Church leadership. 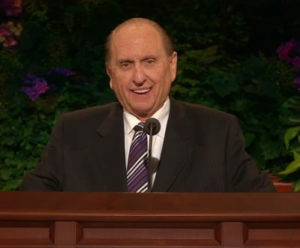 The senior apostle presides at a meeting of the Quorum of the Twelve to consider two alternative propositions: Should the First Presidency be reorganized at this time? 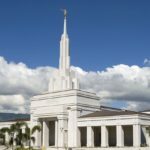 Should the Church continue to function with the Quorum of the Twelve presiding? After discussion, a formal motion is made and accepted by the Quorum of the Twelve Apostles. If a motion to reorganize the First Presidency is passed, the Quorum of the Twelve unanimously selects the new president of the Church. The new president chooses two counselors and the three of them become the new First Presidency. Throughout the history of the Church, the longest-serving apostle has always become the president of the Church when the First Presidency has been reorganized. The president of the Quorum of the Twelve, along with the rest of the apostles, sets apart the new president of the Church through a formal laying on of hands. President Harold B. Lee, 11th president of the Church, explained: “[The Lord] knows whom he wants to preside over this church, and he will make no mistake. The Lord doesn’t do things by accident. He has never done anything accidentally” (in Conference Report, Oct. 1970, 153; or Improvement Era, Dec. 1970, 127). President Ezra Taft Benson, 13th president of the Church, taught that “God knows all things, the end from the beginning, and no man becomes president of the church of Jesus Christ by accident, or remains there by chance, or is called home by happenstance” (“Jesus Christ—Gifts and Expectations,” New Era, May 1975, 16–17). President Gordon B. Hinckley, 15th president of the Church, explained that each member of the Quorum of the Twelve “holds the keys of this dispensation in latent reserve. Inherent in that divine residual is the assured ongoing leadership of the Church” (in Conference Report, Apr. 1983, 4; or Ensign, May 1983, 6). 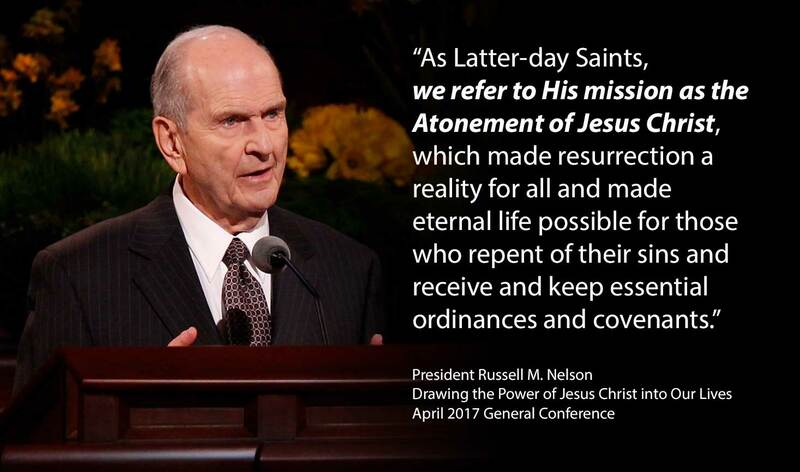 Though we often refer to the president of the Church as “The Prophet”, it is important to remember that we sustain all the apostles in the First Presidency and Quorum of the Twelve as prophets, seers, and revelators. I know that these brethren have been called by God and have the priesthood authority necessary to lead the Lord’s Church. It is a beautiful process to see how smooth the transition is from one president of the church to the next. It is a process ordained by God and guided by Him. For much more information on this subject, see the Foundations of the Restoration Teacher Manual, 2015, Chapter 23: Succession in the Presidency. 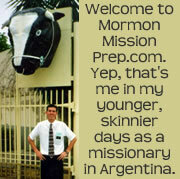 Jimmy https://mormonmissionprep.com/wp-content/uploads/2018/10/mission-prep-logo-for-website.jpg Jimmy2013-06-12 12:35:542017-11-18 08:19:20How is the Next Prophet Chosen in the LDS Church? A frequent question I receive from young readers is regarding the repentance process. In many of these cases, the young people have developed their testimony of the restored gospel of Jesus Christ, and they desire to serve a mission. Upon reflection of their past actions, though, they realize they have committed serious sins that need to be cleared up, so they can be worthy to go. In many cases, they are wondering if they will ever be able to go on a mission. In either case, they are seeking encouragement to begin the repentance process. Some serious sins can prevent you from ever serving a mission. Your bishop is the one who determines that. But whether or not you have committed serious transgressions, like serious violations of the law of chastity, we all make mistakes and need to utilize the repentance process. The ability to repent and become cleansed of our transgressions is a wonderful gift from our Heavenly Father and His Son Jesus Christ. Because the Savior performed the great atoning sacrifice and suffered for our sins in the garden of Gethsemane and on the cross, we can repent, change our ways, be forgiven, and be made clean and worthy before God. We all need to repent in order to be worthy to return to live with our Heavenly Father. Faith to rely on the Atonement of Jesus Christ. You must have faith that through prayer you can communicate with God and receive your Heavenly Father‘s help to repent and know that He has forgiven you. You must have faith that through the Atonement of Jesus Christ, you can be cleansed and forgiven. “Therefore may God grant unto you, my brethren, that ye may begin to exercise your faith unto repentance, that ye begin to call upon his holy name, that he would have mercy upon you” (Alma 34:17). Sorrow for committing the sin (godly sorrow). Sorrow for sin comes from acknowledging that you have sinned and feeling godly sorrow for having committed the sin. Godly sorrow means that you feel such remorse for having sinned that it causes your heart to break with sadness for what you have done. You realize that you caused the Savior to suffer and bleed at every pore, and you are heartbroken for that. Godly sorrow gives you a sincere desire to change and a willingness to submit to every requirement for forgiveness. It is different from the natural consequences of sin or fear of getting caught. Alma counseled his son Corianton: “Let your sins trouble you, with that trouble which shall bring you down unto repentance” (Alma 42:29). Confession. Confession is telling Heavenly Father through sincere prayer all that you have done wrong and expressing sorrow and a desire to repent and receive His forgiveness. You must confess to those you have injured or wronged. Serious sins, such as breaking the law of chastity, need to be confessed to your bishop or branch president. The Lord has promised, “I, the Lord, forgive sins, and am merciful unto those who confess their sins with humble hearts” (D&C 61:2). Abandonment of sin (forsaking the sin). You must abandon the sin by turning away from it, never doing it again, and regretting that you ever did it. Forsaking the sin is to cease sinning, to resolve never to commit it again, and to stay away from the situations where you may be tempted to repeat the sin. The Lord revealed to the Prophet Joseph Smith, “By this ye may know if a man repenteth of his sins–behold, he will confess them and forsake them” (D&C 58:43). Restitution (seeking to restore the damage as far as possible). You must seek to restore as far as possible all that has been damaged by your sins. For example, a thief should give back what he has stolen. A liar should make the truth known. As we do these things, God will not mention our sins to us when we are judged (see Ezekiel 33:15-16). Righteous living (living a life of obedience). It is not enough simply to stop sinning—you must have a change of heart which brings a desire to fill your life with righteousness and engage in activities which bring spiritual power. You must strive throughout your life to obey all gospel teachings, not just the commandment you broke. The Lord revealed to the Prophet Joseph Smith that “he that repents and does the commandments of the Lord shall be forgiven” (D&C 1:32). How long will the repentance process take? Repentance is a life long process, so we should never stop repenting, leaving behind our mistakes, and coming unto Jesus Christ. Everyone will continue to make mistakes throughout their earthly life, and thanks to the mercy and grace of God, there is no limit to the amount of times a person can sincerely and fully repent (Matt 18:21-22 and Mosiah 26:30). However, when young people often ask me how long the repentance process will take, what they mean is, how long will they have to go without some of the privileges of Church membership after they have committed serious sin? Privileges like taking the sacrament each week, holding a calling, going to the temple, and going on a full-time mission. The LDS Church Handbook for bishops and stake presidents says that a person who has been guilty of serious violation of the law of chastity must fully repent before they can go on a mission and partake of the other privileges mentioned above. The bishop and stake president have the responsibility to confirm that the person is free from serious transgression for a sufficient time to make sure they have manifested true repentance (see D&C 107: 72). This period can be as long as three years for multiple serious transgressions and should not be less than one year from the most recent serious incident. May the Lord guide you and direct you through the promptings of His Holy Spirit as you go through the repentance process. Forgiveness is a supremely wonderful blessing for those that repent. Remember that because of the death and suffering of our Savior Jesus Christ, his atoning sacrifice, and by following His prescribed ordinances, “though your sins be as scarlet, they shall be as white as snow; though they be red like crimson, they shall be as wool” (Isaiah 1:18). 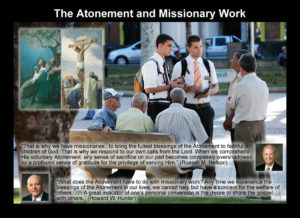 The 3rd Article of Faith states that “We believe that through the Atonement of Christ, all mankind may be saved, by obedience to the laws and ordinances of the gospel.” For a lot of young future missionaries, this statement begs the question: What is an ordinance? It will be your purpose as a missionary to bring the people of the world those first saving ordinances of baptism and the gift of the Holy Ghost through confirmation. With each of these saving ordinances, we enter into a solemn covenant with God where we make promises to obey His commandments and God, in turn, promises us salvation and exaltation if we are faithful. Ordinances and covenants help remind us who we are and of our duty to God. The Lord has provided ordinances to help us come unto Him and receive eternal life. When we honor our covenants, He strengthens us spiritually. 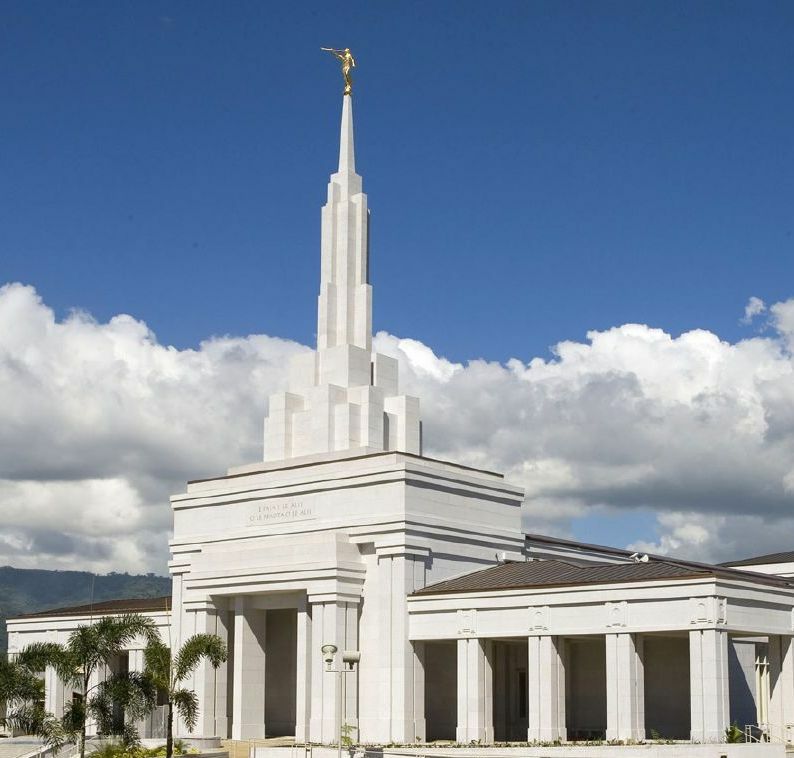 “More than 2,000 years or so ago there was one temple in the Old World and two or three temples in Book of Mormon history, but now temples are multiplying so rapidly we can hardly count them! Add the miracle of the computer, which helps us document our family histories and perform saving ordinances for our dead. Add modern transportation, which allows General Authorities to circle the globe and personally bear witness of the Lord to all the Saints in all the lands. Add that where we cannot go we can now “send,” as the scriptures say, with satellite broadcasts (see D&C 84:62)” (“This, the Greatest of All Dispensations,” Ensign, Jul 2007, 52–58). I couldn’t agree more that one of the best things future missionaries can do to prepare for the mission field is to strengthen their knowledge and testimony of the basic doctrines of the restored gospel of Jesus Christ. Therefore, in the coming weeks and months, I plan to devote several posts to explaining and testifying of the basic gospel doctrines. 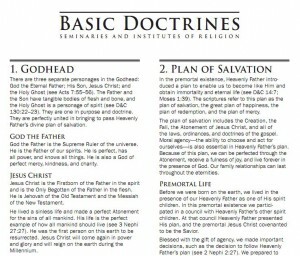 The Basic Doctrines can be found on the Church’s Seminary website. There you can read these doctrinal statements or download a five-page PDF of the Basic Doctrines. For your convenience, below I also summarize the Basic Doctrines. There are three separate personages in the Godhead: God the Eternal Father; His Son, Jesus Christ; and the Holy Ghost (see Acts 7:55-56). The Father and the Son have tangible bodies of flesh and bone, and the Holy Ghost is a personage of spirit (see D&C 130:22-23). They are one in purpose and doctrine. They are perfectly united in bringing to pass Heavenly Father’s divine plan of salvation. In the premortal existence, Heavenly Father introduced a plan to enable us to become like Him and obtain immortality and eternal life (see D&C 14:7; Moses 1:39). The scriptures refer to this plan as the plan of salvation, the great plan of happiness, the plan of redemption, and the plan of mercy. The plan of salvation includes the Creation, the Fall, the Atonement of Jesus Christ, and all of the laws, ordinances, and doctrines of the gospel. Moral agency-the ability to choose and act for ourselves-is also essential in Heavenly Father’s plan. Because of this plan, we can be perfected through the Atonement, receive a fulness of joy, and live forever in the presence of God. Our family relationships can last throughout the eternities. Heavenly Father is the Supreme Creator. Jesus Christ created the heavens and the earth under the direction of the Father. The earth was not created from nothing; it was organized from existing matter. Jesus Christ has created worlds without number. The creation of an earth was essential to God’s plan. It provided a place where we could gain a physical body, be tested and tried, and develop divine attributes. …Adam and Eve’s transgression and the resultant changes, including spiritual and physical death, are called the Fall. In the Garden of Eden, God commanded Adam and Eve not to partake of the fruit of the tree of knowledge of good and evil; the consequence of doing so would be spiritual and physical death. Spiritual death is separation from God. Physical death is the separation of the spirit from the mortal body. To atone is to suffer the penalty for sin, thereby removing the effects of sin from the repentant sinner and allowing him or her to be reconciled to God. Jesus Christ was the only one capable of making a perfect Atonement for all mankind. His Atonement included His suffering for the sins of mankind in the Garden of Gethsemane, the shedding of His blood, His suffering and death on the cross, and His Resurrection from the tomb (see Isaiah 53:3-5; D&C 19:16-19). The Savior was able to carry out the Atonement because He kept Himself free from sin and had power over death. From His mortal mother, He inherited the ability to die. From His immortal Father, He inherited the power to take up His life again. A dispensation is a period of time when the Lord reveals His gospel doctrines, ordinances, and priesthood. It is a period in which the Lord has at least one authorized servant on the earth who bears the holy priesthood and who has a divine commission to dispense the gospel to the inhabitants of the earth. The dispensation of the fulness of times is the final dispensation. It began with the revelation of the gospel to Joseph Smith. …When people turn away from the principles of the gospel and do not have priesthood keys, they are in a state of apostasy. Periods of general apostasy have occurred throughout the history of the world. One example is the Great Apostasy, which occurred after the Savior established His Church (see 2 Thessalonians 2:1-3). After the deaths of the Savior’s Apostles, men corrupted the principles of the gospel and made unauthorized changes in Church organization and priesthood ordinances. …The Restoration is God’s reestablishment of the truths and ordinances of His gospel among men on earth (see Isaiah 29:13-14; Revelation 14:6-7)…. The Restoration began in 1820 when God the Father and His Son, Jesus Christ, appeared to Joseph Smith in response to his prayer (see Joseph Smith-History 1:15-20). A prophet is a person who has been called by God to speak for Him (see Amos 3:7). Prophets testify of Jesus Christ and teach His gospel. They make known God’s will and true character. They denounce sin and warn of its consequences. At times, they prophesy of future events. We sustain the President of the Church as prophet, seer, and revelator and the only person on the earth who receives revelation to guide the entire Church. We also sustain the counselors in the First Presidency and the members of the Quorum of the Twelve Apostles as prophets, seers, and revelators (see D&C 1:38). The priesthood is the eternal power and authority of God. Through the priesthood God created and governs the heavens and the earth. Through this power He redeems and exalts His children, bringing to pass “the immortality and eternal life of man” (Moses 1:39). God gives priesthood authority to worthy male members of the Church so they can act in His name for the salvation of His children. Priesthood holders can be authorized to preach the gospel, administer the ordinances of salvation, and govern the kingdom of God on the earth. This authorization comes from those leaders who hold priesthood keys. “We believe that the first principles and ordinances of the Gospel are: first, Faith in the Lord Jesus Christ; second, Repentance; third, Baptism by immersion for the remission of sins; fourth, Laying on of hands for the gift of the Holy Ghost” (Articles of Faith 1:4). In the Church, an ordinance is a sacred, formal act that has spiritual meaning. Each ordinance was designed by God to teach spiritual truths. The ordinances of salvation are performed by the authority of the priesthood and under the direction of those who hold priesthood keys. Some ordinances are essential to exaltation and are called saving ordinances. They include baptism, confirmation, ordination to the Melchizedek Priesthood (for men), the temple endowment, and the marriage sealing. …A covenant is a sacred agreement between God and man. God gives the conditions for the covenant, and we agree to do what He asks us to do; God then promises us certain blessings for our obedience (see D&C 82:10; 84:33-39). All the saving ordinances of the priesthood are accompanied by covenants. Commandments are the laws and requirements that God gives to mankind. We manifest our love for Him by keeping His commandments (see John 14:15). Keeping the commandments will bring blessings from the Lord (see D&C 130:20-21). The two most basic commandments are “Love the Lord thy God with all thy heart, and with all thy soul, and with all thy mind…And…love thy neighbour as thyself” (Matthew 22:37, 39).